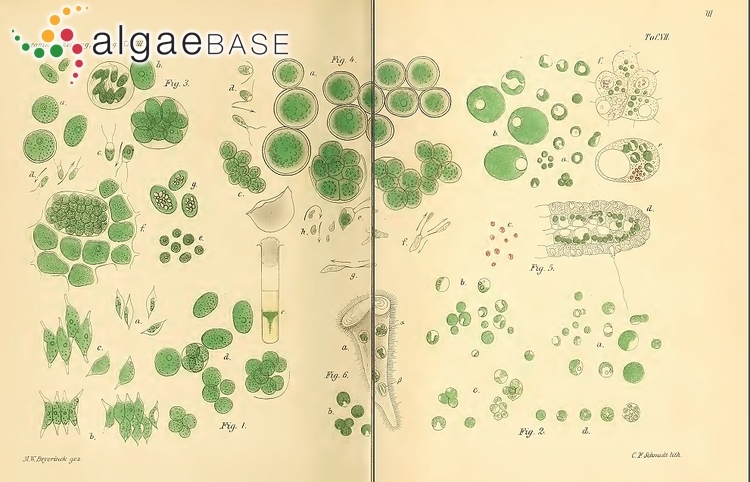 Original plate; Chlorella vulgaris is Fig. 2. 31 Jan 2012. M.D. Guiry. © M.D. Guiry. Seattle, Washington, USA; cement wall, 1000x, DIC. 01 Nov 2008. Karl Bruun. © Karl Bruun (skogenman@earthlink.net). Published in: Beyerinck [Beijerinck], M.W. (1890). Culturversuche mit Zoochlorellen, Lichenengonidien und anderen niederen Algen. Botanische Zeitung 47: 725-739, 741-754, 757-768, 781-785. 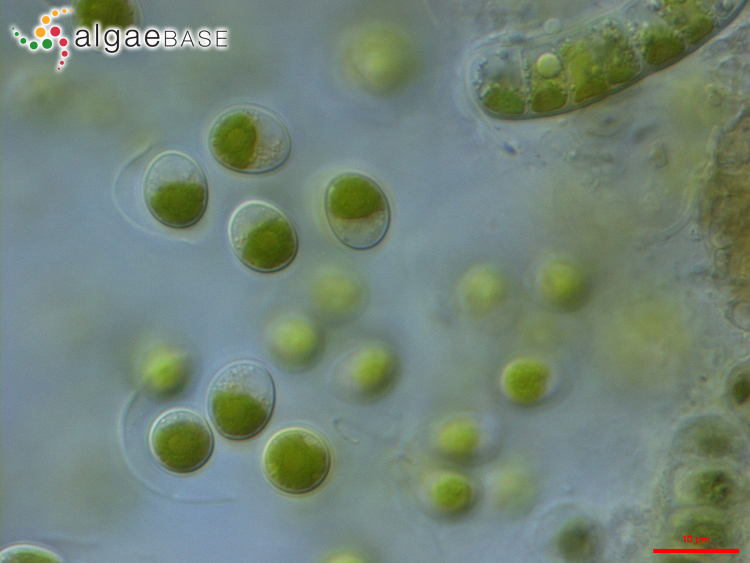 This is the type species (lectotype) of the genus Chlorella. Type locality: [Pond near Delft, The Netherlands] (Hanagata et al. 1998: 222). Andreyeva, V.M (1998). Poczvennye i aerophilnye zelyonye vodorosli (Chlorophyta: Tetrasporales, Chlorococcales, Chlorosarcinales). Terrestrial and aerophilic green algae (Chlorophyta: Tetrasporales, Chlorococcales, Chlorosarcinales). pp. -349, , 108 pls. St Petersberg: "NAUKA". Fott, B. & Nováková, M. (1969). A monograph of the genus Chlorella. The freshwater species. In: Studies in Phycology. (Fott, B. Eds), pp. 10-74. Stuttgart: Schweizerbart'sche. Gors, M., Schumann, R., Gustavs, L. & Karsten, U. (2010). The potential of ergosterol as chemotaxonomic marker to differenciate between "Chlorella" species (Chlorophyta) (Note). Journal of Phycology 46(6): 1296-1300. Hindák, F. (1980). 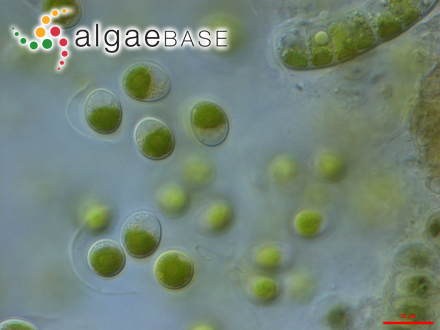 Studies on the chlorococcal algae (Chlorophyceae). II. Biologicke Práce 26: 1-195. Hindák, F. (1984). Studies on the chlorococcal algae (Chlorophyceae) III. Biologické Práce 30: 1-312. Khaybullina, L.S., Gaysina, L.A., Johansen, J.R. & Krautova, M. (2010). Examination of the terrestrial algae of the Great Smoky Mountains National Park, USA. Fottea, Olomouc 10: 201-215. Komárek, J. & Fott, B. (1983). Chlorophyceae (Grünalgen) Ordnung: Chlorococcales. Das Phytoplankton des Süsswassers. In: Das Phytoplankton des Süsswassers (Die Binnengewässer) XVI. (Huber-Pestalozzi, G. Eds), pp. -x, -1044. Stuttgart: E. Schweizerbart'sche Verlangbuchhandlung (Nägele u. Obermiller). Krienitz, L., Hegewald, E.H., Hepperle, D., Huss, V.A.R., Rohr, T. & Wolf, M. (2004). Phylogenetic relationship of Chlorella and Parachlorella gen. nov. (Chlorophyta, Trebouxiophyceae). Phycologia 43: 529-542, 19 figs, 3 tables. Lin, C.S. & Wu, J.T. (2014). Tolerance of soil algae and cyanobacteria to drought stress. Journal of Phycology 50(1): 131-139. Phillipson, J. (1935). Some algae of Victorian soils. Proceedings of the Royal Society of Victoria, New Series 47: 262-287, 33 figs. Shahnaz, A., Zarina, A., Masud-ul-Hasan & Shameel, M. (2007). Survey of some Volvocophyta Shameel from Lahore, Pakistan. International Journal of Phycology and Phycochemistry 3(2): 205-212. Shihira, I. & Krauss, R.W. (1965). Chlorella. Physiology and taxonomy of forty-one isolates. pp. 1-97. Maryland: University of Maryland, College Park. Tsarenko, P.M. & John, D.M. (2011). Phylum Chlorophyta. Order Chlorellales. In: The freshwater algal flora of the British Isles. An identification guide to freshwater and terrestrial algae. Second edition. (John, D.M., Whitton, B.A. & Brook, A.J. Eds), pp. 475-499. Cambridge: Cambridge University Press. Yamamoto, M., Nozaki, H., Miyazawa, Y., Koide, T. & Kawano, S. (2003). Relationship between presence of a mother cell wall and speciation in the unicellular microalga Nannochloris (Chlorophyta). Journal of Phycology 39(1): 172-184. Accesses: This record has been accessed by users 39646 times since it was created. Cacco, G. & Ferrari, G. (1975). Isolation of nitrosoguanidine-induced Chlorella vulgaris mutants with high methionine content. Journal of Phycology 11: 139-141, 3 tables. Caporgno, M.P., Olkiewicz, M., Fortuny, A., Stuber, F., Fabregat, A., Font, J., Pruvost, J., Lepine, O., Legrand, J. & Bengoa, C. (2016). Evaluation of different strategies to produce biofuels from Nannochloropsis oculata and Chlorella vulgaris. Fuel Processing Technology 144: 132-138. Chia, M.A., Lombardi, A.T., Da Graca Gama Melao, M. & Parrish, C.C. (2013). Effects of cadmium and nitrogen on lipid composition of Chlorella vulgaris (Trebouxiophyceae, Chlorophyta). European Journal of Phycology 48(1): 1-11. Coder, D.M. & Starr, M.P. (1978). Antagonistic association of the chlorellavorus bacterium ("Belloviobrio" chlorellavorus) with Chlorella vulgaris. Cur. Microbiol. 1: 59-64. Creed, I.F., Havas, M. & Trick, C.G. (1990). Effects of arsenate on growth of nitrogen- and phosphorus-limited Chlorella vulgaris (Chlorophyceae) isolates. Journal of Phycology 26: 641-650.
de-Bashan, L.E., Antoun, H. & Bashan, Y. (2008). Involvement of indole-3-acetic acid produced by the growth-promoting bacterium Azospirillum spp. in promoting growth of Chlorella vulgaris. Journal of Phycology 44: 938-947.
de-Bashan, L.E., Magallon, P., Antoun, H. & Bashan, Y. (2008). Role of glutamate dehydrogenase and glutamine synthetase in Chlorella vulgaris during assimilation of ammonium when jointly immobilized with the microalgae-growth-promoting bacterium Azospirillum brasilense. Journal of Phycology 44: 1188-1196.
de-Bashan, L.E., Schmid, M., Rothballer, M., Hartmann, A. & Bashan, Y. (2011). Cell-cell interaction in the eukaryote-prokaryote model of the microalgae Chlorella vulgaris and the bacterium Azospirillum brasilense immobilized in polymer beads. Journal of Phycology 47(6): 1350-1359. Eixler, S., Karsten, U. & Selig, U. (2006). Phosphorus storage in Chlorella vulgaris (Trebouxiophyceae, Chlorophyta) cells and its dependence on phosphate supply. Phycologia 45: 53-60. Escapa, C., Coimbra, R.N., Paniagua, S., García, A.I. & Otero, M. (2017). Comparison of the culture and harvesting of Chlorella vulgaris and Tetradesmus obliquus for the removal of pharmaceuticals from water. Journal of Applied Phycology 29(3): 1179-1193. Gouveia, L., Choubert, G., Gomes, E., Rema, P. & Empis, J. (1998). Use of Chlorella vulgaris as a carotenoid source for rainbow trout: effect of dietary lipid content on pigmentation, digestibility and retention in the muscle tissue.. Aquaculture International 6: 269-279. Hosmani, S.P. (1976). Effect of extract of Microcystis aeruginosa on the growth of Chlorella vulgaris. Beitr. Biol. Pflanzenphysiol 51: 321-324. Kong, S.-K. & Toshiuki, N. (2002). Activity of Chlorella vulgaris associated by Escherichia coli W3110 on removal of total organic carbon in continuous river water flow system. Algae 17(3): 195-199, 4 figs, 2 tables. Maeda, S., Mizoguchi, M., Ohki, A. & Takeshita, T. (1990). Bioaccumulation of Zinc and Cadmium in freshwater alga, Chlorella vulgaris .1. toxicity and accumulation. Chemosphere 21(8): 953-963. Maeda, S., Mizoguchi, M., Ohki, A., Inanaga, J. & Takeshita, T. (1990). Bioaccumulation of Zinc and Cadmium in freshwater alga, Chlorella vulgaris .2. association mode of the metals and cell tissue. Chemosphere 21(8): 965-973. Mahdy, A., Méndez, L., Tomás-Pejó, E., Morales, M.M., Ballesteros, M. & González-Fernández, C. (2016). Influence of enzymatic hydrolysis on the biochemical methane potential of Chlorella vulgaris and Scenedesmus sp. Journal of Chemical Technology and Biotechnology 91(5): 1299-1305. Martinez, F., Ascaso, C. & Orus, M.I. (1991). Morphometric and stereologic analysis of Chlorella vulgaris under heterotrophic growth conditions. Ann Bot 67(3): 239-245. Muñoz, M.J., Ramos, C. & Tarazona, J.V. (1996). Bioaccumulation and toxicity of hexachlorobenzene in Chlorella vulgaris and Daphnia magna. Aquatic Toxicology 35: 211-220. Müller, J., Friedl, T., Hepperle, D., Lorenz, M. & Day, J.G. (2005). Distinction between multiple isolates of Chlorella vulgaris (Chlorophyta, Trebouxiophyceae) and testing for conspecificity using amplified fragment length polymorphism and ITS rDNA sequences. Journal of Phycology 41: 1236-1247. Nasir, N.T.B.M., Sahin, S., Cakmak, Z.E. & Cakmak, T. (2017). Optimization of ultrasonic-assisted extraction via multiresponse surface for high antioxidant recovery from Chlorella vulgaris (Chlorophyta). Phycologia 56(5): 561-569. Oyamada, N., Takahashi, G. & Ishizaki, M. (1991). Methylation of inorganic selenium compounds by freshwater green algae, Ankistrodesmus sp., Chlorella vulgaris and Selenastrum sp.. Eisei Kagaku-Japan J Tox Envi 37(2): 83-88. Patterson, G.W. (1967). The effect of culture conditions on the hydrocarbon content ofChlorella vulgaris. Journal of Phycology 3: 22-23, 2 figs. Perez-Garcia, O., Bashan, Y. & Puente, M.E. (2011). Organic carbon supplementation of sterilized municipal wastewater is essential for heterotrophic growth and removing ammonium by the microalga Chlorella vulgaris. Journal of Phycology 47(1): 190-199. Perez-Garcia, O., de-Bashan, L.E., Hernandez, J.-P. & Bashan, Y. (2010). Efficiency of growth and nutrient uptake from wastewater by heterotrophic, autotrophic, and mixotrophic cultivation of Chlorella vulgaris immobilized with Azospirillum brasilense. Journal of Phycology 46(4): 800-812. Post, A.F., Cohen, I. & Romem, E. (1994). Characterization of two Chlorella vulgaris (Chlorophyceae) strains isolated from wastewater oxidation ponds. Journal of Phycology 30: 950-954, 5 figs, 2 tables. Puglisi, I., Barone, V., Sidella, S., Coppa, M., Broccanello, C., Gennari, M. & Baglieri A. (2018). Biostimulant activity of humic-like substances from agro-industrial waste on Chlorella vulgaris and Scenedesmus quadricauda. European Journal of Phycology 53(3): 433-442. Rachlin, J.W. & Grosso, A. (1991). The effects of pH on the growth of Chlorella vulgaris and its interactions with Cadmium toxicity. Arch Environ Contam Toxicol 20(4): 505-508. Ramos Targarona, R. & Pizarro, R. (2018). Crecimiento y capacidad de biorremediación de Chlorella vulgaris (Trebouxiophyceae, Chlorophyta) cultivada en aguas residuales generadas en el cultivo del pez dorado Seriola lalandi (Perciformes: Carangidae). Revista de Biologia Marina y Oceanografia 53(1): 75-86. Ting, Y.P., Lawson, F. & Prince, I.G. (1991). Uptake of Cadmium and Zinc by the alga Chlorella vulgaris .2. Multi-ion situation. Biotechnol Bioeng 37(5): 445-455. Vinarova, K., Chankova, S. & Jordanova, S. (1983). Ultrastructure and pigment composition of 2 Chlorella vulgaris B mutant forms. Genetika i Selektsiya 16: 151-156. Zaidi, B. R. & Tosteson, T. R. (1972). Differential adhesion of Chlorella vulgaris during the cell cycle. Proceedings of the International Seaweed Symposium 7: 323-328. Zhao, J., Yang, L., Zhou, L., Bai, Y., Wang, B., Hou, P., Xu, Q., Yang, W. & Zuo, Z. (2016). Inhibitory effects of eucalyptol and limonene on the photosynthetic abilities in Chlorella vulgaris (Chlorophyceae). Phycologia 55(6): 696-702.